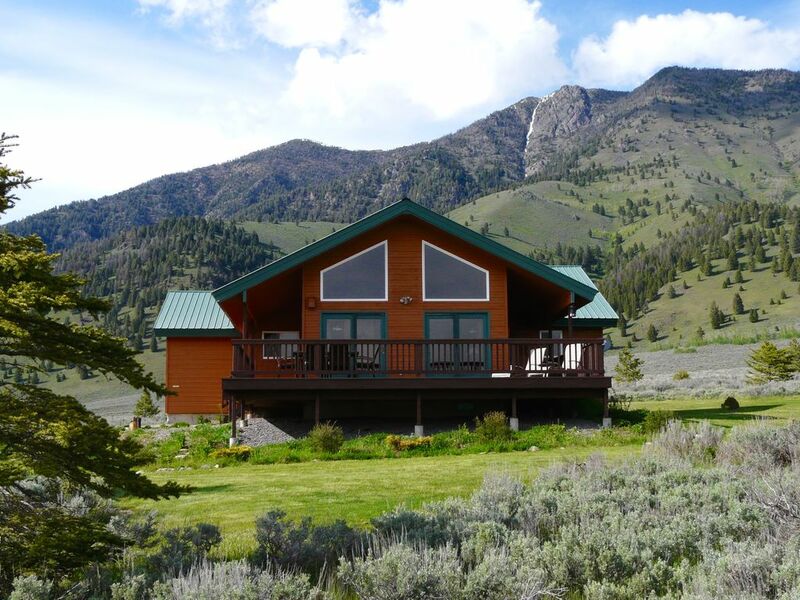 Lakeview Cabin with Great Views of Henry's Lake Close to Yellowstone Park! Lakeview Cabin is located 19 miles from West Yellowstone, the west entrance to Yellowstone Park, in Island Park, Idaho. It sits on a hill with truly spectacular views, overlooking Henry's Lake and the surrounding mountains. This 3 bedroom, 2 bathroom vacation home is a great place for a relaxing vacation in beautiful surroundings. It sleeps 8 people comfortably with a king size bed, a queen size bed, a bunk bed and two sleeping pads. The 1 acre property, located on a quiet drive, feels secluded and private. The wrap-around deck with seating for up to 8 offers breathtaking views in all directions. Enjoy having BBQ dinners there, or just sit and gaze at the lake, the sky and the clouds - you'll feel yourself unwind in the peace and majesty of it all. We now have a fire pit in the yard where you can make s'mores! This home is well supplied - we provide linens, towels, all paper goods, shower gel, hand soaps and dish washings soaps, laundry soap, trash can liners, olive oil and herbs/spices, etc. The comfort of our guests is important to us! Information about the interior of the cabin: The cabin has clear-finished pine on the walls and ceilings, creating a bright and rustic atmosphere. The tastefully decorated Great Room with the newly installed carpet has two sets of French doors leading to the deck with another set of windows above. Windows on all three sides give you a panoramic view and you'll be able to enjoy nature's beauty during all seasons. Comfortable couches and rocking chairs invite you to sit back and relax as you enjoy watching your favorite satellite channels on the flat screen TV. Or check out our collection of DVD movies for all ages. There is a second TV with DVD player in the children's room where they'll be able to enjoy their own choice of movies or TV programs. High speed Internet access is available via DSL and wireless service - just bring your electronic devices. Books about fishing, hiking and all the sights in Yellowstone and Teton National Parks and the surrounding area are provided in the canoe-shaped book shelves in the living room. More details about the cabin: The adjoining dining area seats six people. The kitchen is fully equipped with everything you'll need to prepare meals and dine. We supply extra virgin olive oil and herbs and spices for your use. The laundry room is just off the kitchen and is fully supplied with all you need to do laundry. Beyond the kitchen is the master bedroom suite with a king-size bed and a walk-in closet. Here you'll find a desk with high speed Internet access. Its adjoining bathroom has two sinks and a shower. Down the hallway you'll find a queen-size bedroom and a third bedroom with a bunk bed for two. The hallway bathroom has a sink and a bathtub/shower that has sliding glass doors. All bedrooms are supplied with ample closet space, dressers, and have windows that look out on the beautiful surroundings. The attached garage and driveway provide parking for up to five vehicles. There is a nicely landscaped yard with several flower beds. Children will enjoy playing on the surrounding lawn. We purchased Lakeview Cabin in 2007 because of its prime location overlooking Henry's Lake and the mountains of the Continental Divide. Yellowstone Park is only a 20 minute drive away which we found an asset, not only for ourselves but also for our future guests. Island Park has a lot to offer - we love to visit the Mesa Falls, and the Big Springs area with Johnny Sacks' cabin is amazing. We recommend visiting Harriman State Park for horseback riding, or just to hike around and enjoy pristine natural surroundings. Fishing is great, not only in Henry's Lake but the other close by lakes and rivers, such as the Madison River, Hebgen Lake, or Cliff and Wade Lakes.You are welcome to read the guest book comments to find out how prior guests enjoyed staying at this vacation home. The absolutely fabulous panoramic views are sure to make you love your stay at this cabin! The cabin overlooks Henry's Lake and the mountains of the Continental Divide. Mountains can be seen all around the cabin in all their splendor. Washer and dryer are in a separate laundry room. There is a glass top electric stove in the kitchen. We provide olive oil, and herbs and spices for cooking. The cabin has satellite TV. There is a CD player in the cabin. Books about things to see and do in the area and in Yellowstone are provided. Board games and puzzles, as well as playing cards are provided. The vacation home has a collection of CDs. There is a library of DVDs. There is a lawn and flower garden around the cabin. The wrap-around deck has seating for 8. Tennis can be enjoyed in the Island Park Village Resort about 16 miles from the cabin. Golf can also be enjoyed at the Island Park Village Resort (16 miles from the cabin). Yellowstone Park with its geothermal features and wildlife is only 20 minutes away. We now have a fire pit in the yard! Our family of 5 adults stayed in Lakeview Cabin for a week... and everything about it was perfect! The cabin itself is just enough space to accommodate everyone comfortably and is well stocked; we had everything we needed to make delicious dinners at home after a long day of exploring Yellowstone. All of us agreed - we couldn't have made a better choice. Do not hesitate to book this cabin! 1) For grocery shopping, head to West Yellowstone and the market that is on Madison Ave (called "Market Place"); it was definitely superior and the staff is super friendly. 2) Make sure you head into Yellowstone early... and know that if you are leaving the park between 4:30pm-6pm you *will* get stuck in a wildlife traffic jam between Madison jct and West Yellowstone, so plan accordingly. Our family of 4 loved our choice for "home base" on our first trip out west. The "speed ruts" became a source of humor each morning as a wake up call for our Yellowstone adventure. Yellowstone's beauty and diverse landscape were overwhelming. From Old Faithful to the Lamar Valley, we criss-crossed the Park several times. We even squeezed a day trip to the splendor of the Grand Tetons. Our quest to see as much wildlife as possible was almost 100% complete. On our last day we tried to view a bear, but even with getting out before 5 am we were unsuccessful. We did see bison (go to Lamar Valley), moose, elk, pronghorn, coyote. The coyotes/wolf talked to each other while sitting on the cabin's porch. A wonderful trip, that allowed our family to strengthen our relationships. Enjoy your stay! Get up early and beat the crowds - worth it. Lakeview Cabin has a gorgeous location, overlooking Henry's Lake and the mountains of the Continental Divide. The cabin is close to Henry's Lake State Park. This world renowned fishery is a trout angler's dream. The park is named after the explorer Major Andrew Henry. Here you can fish for brook, rainbow trout and cutthroat hybrids. Or fish closer to Lakeview Cabin - public fishing access to Henry's Lake is 1.6 miles from the cabin. The Upper and Lower Mesa Falls and Harriman State Park, also in Island Park, are well worth a visit. You can take interesting day trips into Yellowstone Park. This Park is a wonderland of rivers, lakes, waterfalls, canyons, boiling mud pots and geysers, and is home to wildlife such as elk, deer, moose, bison, wolves, coyotes, and bears, and many birds of prey. Teton National Park, 80 miles to the southeast, is also well within reach for day trips. Payments must be made by credit card via the HomeAway payment system. This vacation home is closed from December 1-April 19.